Just got the Gecko in the mail today. Took less than a minute to install. Pretty sweet! The spot is soooo much better than the halogen bulb that comes with it. I Got the new Full-face S2 module. I got the email that it will ship tomorrow. I hope i get it before my trip at the end of the month. cavemud2 wrote: I Got the new Full-face S2 module. I got the email that it will ship tomorrow. I hope i get it before my trip at the end of the month. I'm completely satisfied with mine. Let us know what you think. I got a fullface R4 in hand. It's cheeper than both separate modules together. But it provides disadvantages too! There is only one common LED driver inside and you can set both lights in parallel 1:1 only - but in three levels. The driver is a 2x 7135 linear driver controled by PWM chip. 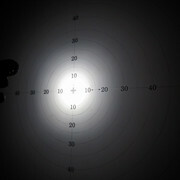 The optic of the wide beam part provides a week soft spot with a wide spill, somewhat like the beam pattern of the old Cree XR-E type. The optic of the narrow beam part is a TIR with a strong spot an also a lot of spill around it. 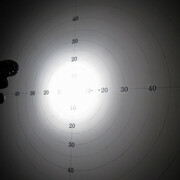 Both beams are concentric to one another and deliver a superpositioned beam pattern comparable to a single frosted TIR optic. For my experience, the resulting beam is too narrow for walking in a cave. 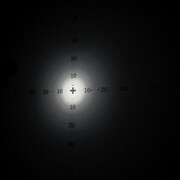 Here are some beam shots. The fullface insert could be improved, if the wide beam would be tilt downwards as much as mechanically achievable and or the narrow beam as much as possible upwards. It would be further improved, if the ratio of wide and narrow part would not be bound to 1:1 at all nevels too. I hope CustomDuo could improve the fullface insert. I've joined to the customduo users group. I've got the Gecko pack. Only with one modification the normal lamp can be switched to 3 modes instead of 2. It was awesome, while digging in our cave in Budapest, Hungary. 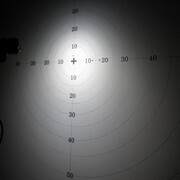 It is far mor efficient and usable than the 5 module led. Tobias wrote: I hope CustomDuo could improve the fullface insert. Hey Tobias, thanks for the thoughts. The Full-face modules are intended to be a relatively low cost, simple to use and easy to install upgrade; working on the principal that for every one of us light geeks out there, that there are many more cavers who in reality just want something simple, effective and reliable. However, I have taken onboard the points you make, and maybe I should design a Full-face module for the more ‘techi’ end of the market; with dual current control circuitry and LEDs controllable both separately and together in varying degrees. I guess it will be no problem to widen the light output and add full flood to suit your personal preference (though IMO the spread is already fairly optimised). Last edited by bif on Mar 7, 2012 4:56 pm, edited 1 time in total. I'm currently finalising my own twin-beam Duo unit, with control options including at least both a simple UI (Petzl 14-LED-like operation, with preselected degree of beam blending (at least low/high blend options) and also a UI similar to the one I've been using in the premium versions of my mining lamp inserts, with independent simultaneous 4-level control of both LEDs. Debouncing is fun, since the switches in the Duo (at least the ones I'm using for testing) can be extremely 'dirty'. Though I suppose it is good to have bad lights to do the testing on. Got my unit in the mail today and it looks awesome. Other than i had to take the batteries out and reverse them. Is there any way to change that? its no big deal to me. I cant wai till next weekend to get it underground. Thanks Bif. cavemud2 wrote: Got my unit in the mail today and it looks awesome. Other than i had to take the batteries out and reverse them. Is there any way to change that? There isn't a nicer way. potholer wrote: There isn't a nicer way. Dave is about right. Pre 2004, some (but not all) Duos were wired up the other way around. Im fairly sure this was because pre LEDs then polarity wasn't important, so how they were wired up was a lottery. Reversing the batteries in the Duo doesn't really have any negative consequence anyway, as the battery holder has matching connections for both the positive and negative ends of the cells. I can wire up Gecko modules the other way around, but there is little point in doing so, unless the Duo turns out to be an old one that was wired up in reverse and with a battery scenario that can't be reversed. I did once come across such a Duo, with a rechargeable Accupack that caused a little confusion, so we built up a back to front module and all was well. Hey thats not a problem. If it functions the same without harm to the unit then im fine with it. Another question. I want to mount it to my helmet. But i want the wire on the inside. Is there a way i can do that? cavemud2 wrote: Another question. I want to mount it to my helmet. But i want the wire on the inside. Is there a way i can do that? If you have a standard Duo (ie with headstrap) and you want to turn it into a 'fixo' (ie helmet fixing with screws) then this is the basic procedure. Ignore the Petzl drilling template and use initiative. Think about holes on battery box with a little care as screws go into box at a slightly funny angle. Screws should be getable on ebay for a couple of bucks.